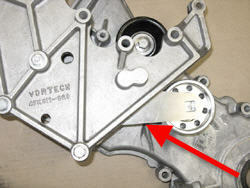 This product is used by the Ford Racing Team. P/N PM-1002-76 or PM-1002-90. This may be used on either 6 or 8 rib setups. For Ford 4V cars with 96-99 front cover (3 bolts). This Belt Tensioner is specifically designed to fit perfectly under a Vortech Supercharger bracket without any modifications or alterations. Constructed with Heavy Duty CNC Machined Aluminum Bracket. 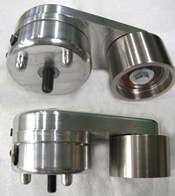 Available in silver only - Can also be used with 90mm & 100mm pulleys.